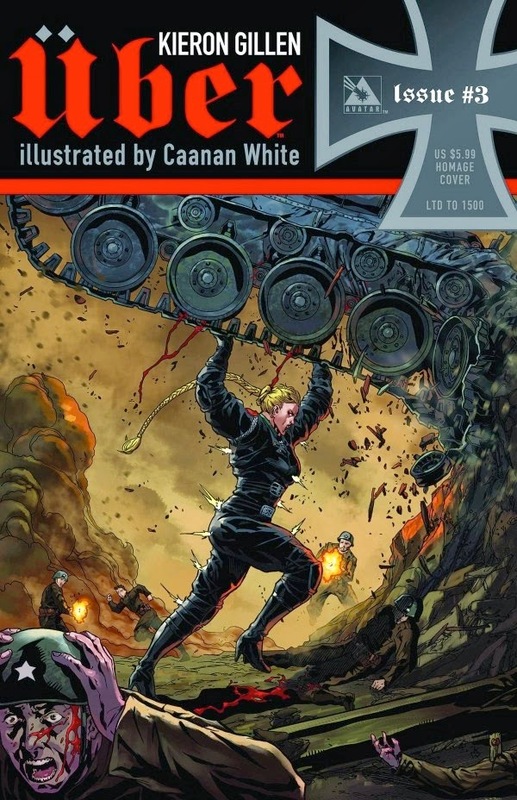 Kieron Gillen's Über is an ongoing comic book series set at the fag end of World War Two. It offers a chillingly imaginative and thoroughly gruesome alternate denouement to the Second World War. "I didn't want to write a book about superhumans. I wanted to write a book about humans and their relationship with power. I hope you find it fascinating and compelling. I hope you don't enjoy it." At time of writing I've just laid aside issue #20. I'll be back for more in issue #21, so double tick on fascinating and compelling. The seed of the book can be found in the much mythologized Wunderwaffe, the super weapons touted by the Nazi propaganda machine, of which only the V1 and V2 bombs (said to have been developed out of the same programme) ever came to full, murderous fruition. Gillen takes things a step further, pulling the Übermensch (super men) out of the bag. When the Nazis develop a superhuman soldier, the British reply with their own Tank Men, the arms race escalates and the war runs on to grim stalemate. 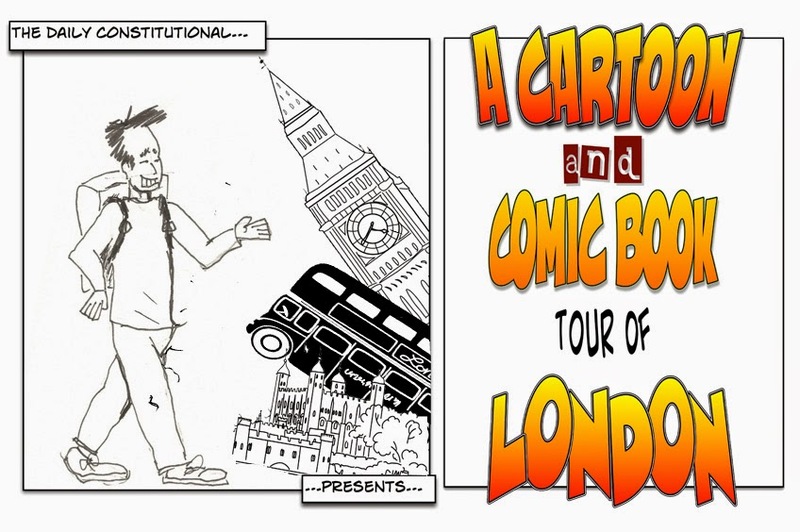 Issue #11 is going centre stage in our Cartoon & Comic Book Tour of London, but we're treading carefully – there's a monumental spoiler to avoid in this issue, the revelation of which would be to ruin the impact of the entire series. All we can say is that there's a clue in the word "monumental" and that Über takes two legendary symbols of Britishness and besmirches one with the other in a violent and truly shocking way. Enter artist Cannan White and his propensity for gory detail. His work, vivid and dynamic, is horribly haunting. Which brings us, perhaps, to why Mr. Gillen hopes that we don't necessarily enjoy this book. Is it too gory? Not in the context. I for one am quite comfortable with the horrors of war being presented outside the garlanded upper echelons of literary fiction. It's no bad thing that comic books with a wartime theme can, from time to time, move away from the bang-bang-you're-dead antics of the Commando comics of my childhood. The scene we've chosen here sees Battleship-Class Übermensch Sieglinde attacking the Treasury building in Westminster – with the now famous Cabinet War Rooms beneath. In terms of fiction, the scenes of destruction in London are affecting, and the obliteration of Haussmann's Paris even more so. But this being in part an alternative history, Gillen brings real characters into his narrative, too – Churchill, Hitler, Albert Speer and Alan Turing among them. His delight in weaving historical detail into the narrative is palpable but never clumsy. The story chimes with Wagnerian references that could clang in a lesser writer's hands. Nietzsche is in the mix, too, with Gillen taking the Übermensch concept from Thus Spake Zarathustra – which, when viewed through the twisted prism of Nazism, resulted in the biological master race philosophy and the barbarous work of the death camps. Gillen seldom lets us stray from the evil that men do, on all sides of the conflict. The context of the superhuman in the story's period setting is also worth noting. As we went to war, the superhero was very much in his infancy. Superman was on the scene and already popular. And the time was ripe for such characters as tools of morale boosting propaganda. 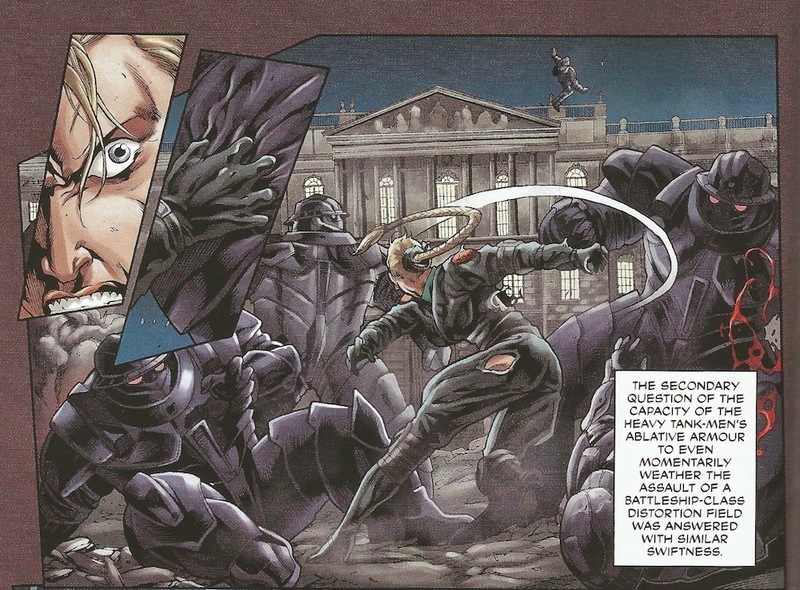 Captain America was a created in the early years of the war when the US pursued a policy of isolation. The cover of his first story shows Cap socking Adolf Hitler squarely in the jaw. You may, of course, be of the opinion that comic books were the least of the art begat by WWII and that Shostakovich's Symphony No.7, say, is of more import. I'm happy to appreciate the merits of both. But if I was called upon to defend the reputation of comic books as vehicles for serious storytelling, my task is made that little bit easier by the sophistication and nuance in Mr. Gillen's work. Alternatively you can pop in to Orbital Comics in Great Newport Street – find Orbital in our earlier post HERE.